There are a variety of reasons to volunteer within the community. Not only does volunteer work help the community, it causes people to be invested in and care more deeply for their community. However, finding volunteer opportunities can be time consuming and difficult, so often volunteering is a nice idea, but it remains just that. According to the Erie Vital Signs website, Erie County is below the state and national average for volunteerism. Getconnectederie.org is a way for the Erie community to change that. The website brings nonprofit organizations and potential volunteers together with ease. 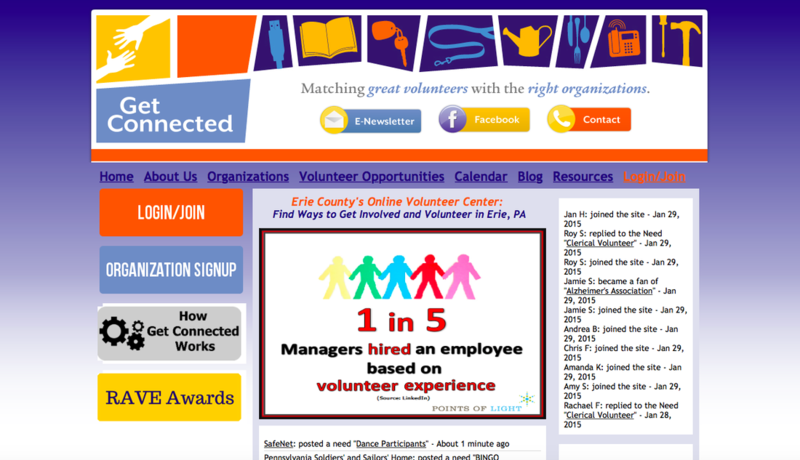 A collaborative effort of The United Way and The Nonprofit Partnership, the site uses an engaging format in order to increase the number of volunteers in the Erie area by providing a place for any nonprofit organization to list their needs. Melissa Fenn, Volunteer Coordinator for Getconnectederie.org, says of the site, "The ultimate goal of Get Connected is to facilitate mutually beneficial relationships between community volunteers and nonprofit organizations in Erie County. Every community member is looking for something different when they make the decision to volunteer; some people are seeking opportunities to work directly with clients or children, while others might prefer working in an office environment." The home page at Get Connected features a slideshow of images and facts that reinforce the mission of the partnership. It also features links to the most recently posted opportunities, a weekly blog, contact information, and page links to specific facets of the site. A great link on the homepage is the "How Get Connected Works" tab. One click takes you to videos and informative images that tell how to use the site easily and effectively. If you still want more information or have questions, there are several PDF documents available for download to further clarify the uses of the site under the "Resources" section. Fenn comments on the different facets of the site, "One of the unique aspects of Get Connected is that it is a resource for the entire community. We are building the list of volunteer opportunities to include activities that are appropriate for youth volunteers, high school students, college students, professionals, and retirees. Get Connected is a place that nonprofit organizations can post all of their opportunities and reach a wide variety of community members at once. There are currently over 300 volunteer, in-kind, and advocacy opportunities posted on Get Connected and we hope to continue to build that list over the next year." The organizations link on the homepage take you to a comprehensive list of all of the partnered organizations. Each organization is hyperlinked to a description of the mission of that particular organization, the opportunities for volunteers within the organization, and contact information. There is the option to become a fan of particular organizations so that you are made aware as soon as those places post new opportunities. For those who find the comprehensive list overwhelming, there is a categorical list that filters the organizations so that potential volunteers can search by areas of interest. This significantly narrows the list of organizations, making it feel more manageable. A click on the "Environment" link gives options to volunteer for organizations such as Asbury Woods Nature Center, Presque Isle State Park Weed Warriors, and Winds of Change. You can also choose to search through volunteer opportunities without choosing a specific organization if you choose the "Opportunities" link on the home page. This page also offers a filter so that you can narrow the category of research based on the time you have to volunteer, the field you are interested in, and your proximity to the volunteer project. If you are worried that you don't have time for a volunteer project or don't know where you fit, Fenn says the site helps with that as well. "Some people are using volunteer projects as a team building activity with a group, while others want to use it as a professional development experience for themselves. Get Connected provides community members with an easy way to search opportunities from over 125 organizations in one, convenient list. This allows someone to search for opportunities that are specific to their interests, skills, and availability. " Signing up on Getconnectederie.org is quick and painless, requiring only your email address and the creation of a password. Once you have signed up, you can begin searching the organizations and opportunities that appeal to you. You can make connections within the community while making the community a better place to live and work.